BELINDA BAUER grew up in England and South Africa. She has worked as a journalist and screenwriter, and her script THE LOCKER ROOM earned her the Carl Foreman/Bafta Award for Young British Screenwriters, an award that was presented to her by Sidney Poitier. She won the CWA Gold Dagger in 2010 for her debut novel BLACKLANDS. Shots’ intrepid reporter SJI Holliday tracked Belinda down and finds out what’s happened since then. SJI: Welcome back to Shots, Belinda – it’s great to have you here again! 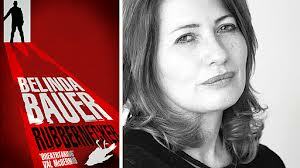 Your latest novel Rubbernecker was released recently and it’s been causing quite a buzz. Can you tell us what it’s about? BB: Hi, Thanks for having me back! Rubbernecker is about an anatomy student who starts to suspect that the cadaver he’s dissecting is a murder victim. He has to retro-engineer the crime before he destroys his own evidence. SJI: That’s a perfect summary! This is your first standalone. How did it feel to leave Shipcott and the familiar cast of characters behind? BB: Well Blacklands was written without thought of a sequel, and Darkside and Finders Keepers were both written so that they could be read alone, even though they did sort of follow on from each other, so really I feel as though I’ve almost written four standalone books! I was conscious that if I didn’t leave Shipcott, then I might be stuck there for ever, so moving on was the only way to go, however much I might miss characters like Steven Lamb and Jonas Holly. However, Rubbernecker was such a pleasure to write that I think it was the right decision. SJI: The main character, Patrick Fort, has a form of Asperger’s Syndrome, and this is central to his actions and the entire premise of the novel. What challenges did you face when developing the character? BB: It took a little while to find Patrick’s voice - I kept giving him too many emotional responses - but once I got him, I found a lot of myself in him, and he was fun to write. What I didn’t want to do was make him Rain Man. I wanted to keep him difficult and challenging, with skills that come from obsession, not from genius. I think that empathy for Patrick comes from watching his frustration and confusion at simply living his life. SJI: Where did the idea come from? Did you start with a spark of an idea or did ‘Patrick’ come first? BB: All my books start with two or three very strong but disparate ideas that suddenly come together and I realise that they could all work as part of a whole. One of these central ideas was indeed Patrick. My first three books were dominated by very sensitive, empathic central characters. With Rubbernecker I set myself the challenge of making my next protagonist a person without much empathy at all. I wanted to see if I could still get the reader to root for him! SJI: Well you’ve definitely achieved that! One of the other major characters, Sam Galen, is in a coma and you managed to effectively capture the desperation he must’ve felt when no one could hear him. How did you research this aspect of the plot? Did you talk to any former coma patients? BB: I did a lot of research into the first hand accounts of coma victims and survivors, their families and carers. I wanted to give a true reflection of the state, beyond the preconceptions most of us have - that people are either awake or asleep. Every case is different, and even if patients emerge from coma, it is not always the blessing most of us would imagine. It was a sobering discovery and I’m grateful to those who shared their experiences with me. SJI: As in your previous novels, there is a lot of dark humour. Is this something you are conscious of as a way to lighten the tone? BB: I find it hard to write a book without some humour in it, because I feel that’s an accurate reflection of real life. I rarely go through a day without finding something funny, even in the darkest situations. SJI: Such as Tracy Evans, the nurse on the neurological ward... Please tell me she was based on someone real? BB: I have been wanting to write a Tracy Evans for a very long time! She was based loosely on a nurse I used to know socially. She was a nice girl, but her whole life outside work revolved around being drunk, and the thought of being in her care used to send shivers down my spine. SJI: So where do you go from here? Has Shipcott run out of murderers? Have we really seen the end of Jonas Holly? BB: It was time to move on from Shipcott, although some characters we met there could well be worth revisiting. But I would never crowbar an old character into a new book just for the sake of it, so it would have to be the perfect story to tempt me. SJI: So what are you working on at the moment? BB: I’m working on my fifth book right now. It’s a very dark story about manipulation and corruption. SJI: Sounds intriguing! I read in your previous interview with Shots that you never saw Blacklands as a ‘crime’ novel; that it was predominately about the relationship between a young boy and his grandmother. Are you a fan of crime novels, or do your prefer to read something else? BB: I didn’t realise at the time what an incredibly flexible genre crime fiction is, because I had never read any crime! Now that I know that, I’m even more mortified to say that since finishing Blacklands I have been unable to read ANY fiction. I am so busy writing that the only reading I do is for research. I had always been a huge reader and I really miss it. SJI: Wow, I can’t imagine not having time to read anymore… occupational hazard though I suppose! I like to ask authors who we should be looking out for in 2013. Your name has come up a couple of times and I know people are very excited about Rubbernecker, which is all set to become a modern classic. Which authors do you think we should be looking out for in 2013? BB: I only wish I knew! SJI: Brilliant! Thanks for talking to me Belinda, best of luck with Rubbernecker. For me, this is much more than a crime novel; and with hints of Mark Haddon and David Nicholls in there, it’s definitely not just for die-hard crime fans, in fact I’m sure it’s going to bring you a whole new readership. BB: Thanks very much. I hope everyone enjoys reading Rubbernecker as much as I enjoyed writing it.